Why should I look for a guru? 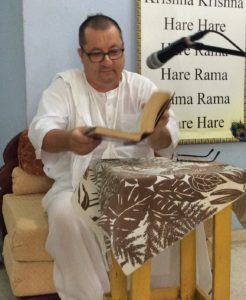 According to the Scriptures and the Acaryas, it is not possible to advance in the spiritual life without studying, serving and being initiated by a bona fide spiritual master. Three words are important in this verse: pariprasna, asking questions, seva, giving service, upadesa, taking initiation. A sincere soul who wants the Absolute Truth should seek a bona fide spiritual Master, asks him questions, gives service and desires initiation, which is the most important moment of human life. What are the most important qualities of a sincere disciple? He should have firm determination to want the Absolute Truth, to seek a bona fide spiritual Master, to ask him questions, to desire initiation and to give service. What are the most important qualities of a bonafide Guru? He has to be part of an authentic parampara (school of spirituality), he must have perfect knowledge, he has to have no material desires and his only desire must be to serve Guru and Krishna. If I find a Guru who inspires me, what should I do to be accepted? If he accepts you, ask him to recite his Pranama Mantra and begin to behave like a disciple. How the mantras for spiritual masters are called? The mantra of the spiritual master is called Guru Pranama Mantra. The mantra for the Guru’s Guru (Srila Prabhupada, in this case) is called Paramaguru Pranama Mantra. What is his pranama mantra? What is the pranama mantra of Srila Prabhupada? When should I recite the Pranama mantra? It is recited all the times that you make obeisances to the Guru, when you begin to chant the maha-mantra, when you offer your food, when you make obeisances to the Murtis (the Deities). How the Guru pranama mantra should be recited? Loud enough so that he could listen, with full devotion. When can I take initiation? The minimum qualifications are to sing a minimum of 16 rounds of japamala a day, and to observe the regulative principles. Unless there are no particular circumstances, the disciple should study and serve the Guru for a minimum of one year. You will have to follow a course with a qualified devotee to learn the many good etiquettes which are important for spiritual advancement. Furthermore you’ll need a recommendation from an Iskcon authority. How should I call the Guru? The Guru should never be called with his simple name, but always with an honorary title. For example “Sri” or better “Srila” before the name. The name must always be followed by the title Maharaja. Titles of respect such as “Guru Maharaja” or “Gurudeva” should be used. Or Srila Guru Maharaja or Srila Gurudeva. How should I behave when I personally meet my spiritual master? Offer obeisances, recite Guru Pranama Mantra, ask questions and offer service with sincerity and devotion. How should I write to the spiritual master? And how does he answer me? accept my blessings. All glories to Srila Prabhupada. Normally one should bow facing the spiritual master, unless the Deities will come on your back or other situations. In these cases it is done giving the left side. Where should I put the photos of the spiritual Master? The photo of the Guru can be placed in any part of the house. It has to be put on the house altar to the right of Srila Prabhupada. It has to be smaller compared to Srila Prabhupada’s. In the case of temples with installed Deities, the photo of the Guru should be set on the altar only when the pujari enters to make the offering and taken out when he leaves. Before the initiation an encounter with the Guru should be held, during which various topics will be explained including what will happen during the fire ceremony. He will also answer questions. Vaisnavas and Vaisnavis who will be initiated must have devotional clothes. Should wear saris and hairs collected, tilaka, a tulasi bead on the neck (kanthimala) that will be replaced after initiation. During initiation the Guru will give to the disciple a new Japa-Mala, which has been chanted on by him for the first time. Vaisnavis should learn the pranam of the Guru and surrender with attitude of devotion, respect and gratitude. New initiates will promise to chant 16 minimum daily rounds and follow the regulative principles. Should wear dhoti, kurta and a sikha in the head (unless he has a serious reason for not being able to have it). Tilaka, a necklace of tulasi beads (kanthimala) that will be replaced after initiation. During initiation the Guru will give to the disciple a new Japa-Mala, which has been chanted on by him for the first time. Vaisnavis should learn the pranama of the Guru and surrender with attitude of devotion, respect and gratitude. New initiates will promise to chant 16 minimum daily rounds and follow regulative principles. It is tradition that after initiation the disciple gives a donation in money to the spiritual master. It is the birthday of the spiritual Master and it is called Vyasa Puja because the Guru is the representative of Vyasadeva. It is one of the most important days of the year for the disciple and he celebrates it with great devotion. The name I receive at the time of initiation is important? It is very important. The devotee should want to be called with that and be proud of a name blessed by the parampara. We suggest changing email, Facebook page or website using that spiritual name. When by habit someone keeps calling him with the legal name, the devotee should ask him to please use his/hers initiate name. I am already initiated but I would like you to be my siksa-guru. What should I do to be accepted and what is my relationship with my Diksa-guru? According to the scriptures there is no difference in value between the Diksa-guru and the Siksa-guru. Both are “Guru Maharaja” and he owes the same respect. The is only a difference in role. In the case that someone already initiated wants to be my “Siksa disciple”, first of all he has to get the blessings from his Diksa-guru. From that day you start to behave like a disciple. I want to be initiated by you, but in the past I have already asked for refuge from another bonafide Guru. What I have to do? Before you can be initiated you must obtain his written blessing.